One of the children, named Joey, said he could "finally close the chapter" now he knew Mr Karbaat was his father. 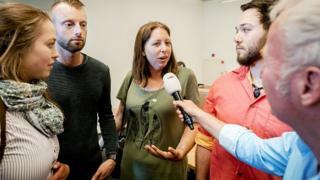 They substantiate "serious suspicions that Mr Karbaat used his own sperm in the clinic", a statement on the website of legal firm Rex Advocate says. Mr Karbaat called himself "a pioneer in the field of fertilisation".